1863 - He was born Apr. 29 in San Francisco to schoolteacher Phoebe Apperson and miner George Hearst. 1880 - George bought the San Francisco Evening Examiner, converted it to a morning paper promoting the Democratic party. 1882 - In his last summer before college, met opera singer Sybil Sanderson at Hotel Del Monte, "a time when the beauty of Monterey, the old Spanish Capital of California, was most glamorous." 1887 - He became owner of Examiner on Mar. 4, at age 24. 1888 - He launched crusades against Southern Pacific Railroad, sent Kelly to bring back grizzly bear Monarch, Winifred Sweet as the first sob sister Annie Laurie, created Little Jim fund drive, tragic Crime of the Century with underwear pictures, Last of the McGintys, published a column called "The Workingman." 1890 - He began new office building in downtown San Francisco for the Examiner, to compete with the new Chronicle building of Michel de Young. 1891 - George died Feb. 28 in DC, body sent to California on Hearst Funeral Train, left estate of $20 million to Phoebe. 1892 - Tour of Europe, Orrin Peck painted his portrait in Munich. 1895 - He bought the N.Y. Morning Journal, published his first issue of the New York Journal Nov. 7. 1896 - He hired Joseph Pulitzer's complete Sunday staff, led by Morrill Goddard, especially Outcault's Yellow Kid who was featured in the supplement American Humorist after Oct. 25. In the presidential election campaign, Hearst was pro-Bryan. 1897 - When the U.P. failed, Hearst bought the New York Morning Advertiser to keep his A.P. franchise. He met Millicent Willson who was a 16-year old "bicycle girl" chorus dancer at the Herald Square Theatre. 1898 - He sent Karl Decker to Cuba, published the stolen de Lome letter, blamed a Spanish undersea mine for causing the Maine explosion. He joined Edison to produce 17 films, the "Edison-Journal views" and used his Anita and Buccaneer yachts to carry reporters and cameramen to Cuba. 1899 - In Dec., newsies strike and boycott won by the newsies against Hearst and Pulitzer. 1900 - Hearst started the Chicago American and the National Association of Democratic Clubs, attacked McKinley and Theodore Roosevelt with cartoons by Davenport and Opper. 1901 - He attacked Tammany Boss Richard Croker, Murphy, Van Wyck, Ice Trust. Hearst was blamed for McKinley death; changed the name of his New York paper to "American and Journal" and then simply the New York American. 1902 - He won election to Congress, but Madison Square Garden fireworks celebration killed dozens. 1903 - He married 21-year old chorus girl Millicent, who would be the mother of his 5 sons: George 1904, Junior 1907, John 1909, twins Randolph & David 1915. 1905 - He moved into the Clarendon apartment; purchased Cosmopolitan magazine to join Motor of 1903, added Good Housekeeping and Hearst's Magazine in 1911 and Harper's Bazaar in 1912. Hearst ran for mayor of New York City. 1907 - Hearst sought to destroy the Democratic party and replace it with his Independence League, but Max Ihmsen failed to win in the contest for sheriff against Big Tom Foley. 1910 - Hearst lost Lt. Gov. race in New York, his "last hurrah as an independent." Next year he declared himself to be a member of the Democratic party. 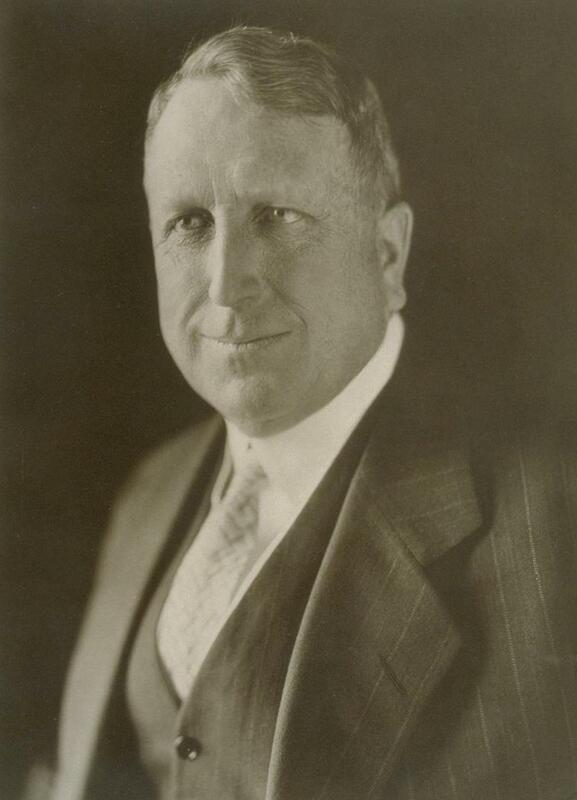 1912 - Hearst supported Champ Clark rather than Woodrow Wilson for the Democratic nomination; critical of Pres. Wilson in 1913 for failing to intervene in Mexico to protect his ranches. 1913 - He created Hearst-Selig newsreel; bought the Clarendon Hotel in New York, danced with Vernon and Irene Castle, decorated it with art; "Collecting was a passion that ranked for him just below journalism and politics." 1915 - He opposed U.S. entry into WWI and was widely hated. He praised Bryan's resignation from Wilson's cabinet over the Lusitania notes; Hearst and Robert McCormick's Chicago Tribune were critical of England's blockade as well as German's submarine; he was prohibited by England from using its cable service, sent his own reporters to Germany who reported by radio to the Sayville, Long Island, radio station. William Bayard Hale sent cables for INS, and Nelson Edwards sent motion pictures from Germany. He was friends with von Bernstorff and Cissy Patterson. Although a pacifist in regard to Europe, he was anti-Japanese and he promoted Pershing expedition against Pancho Villa in Mexico. 1915 - After Christmas he met 18-year old chorus girl Marion Davies who was dancing in Irving Berlin musical Stop! Look! Listen! at the Globe Theater six blocks from his batchelor studio apartment in New York. 1916 - He produced History of the World's Greatest War from German footage; worked with Karl Fuehr and his pro-German American Correspondent Film Company to release German films; sent his own cameraman Nelson Edwards to film behind German lines for Hearst News Pictorial. 1917 - With Walter Brisbane he bought the Washington Times in May; he endorsed John Hylan, the Democratic candidate for mayor of New York, but he was attacked by the New York Times and others as pro-German, "Hearst, Hylan, the Hoenzollerns, and the Hapsburgs." 1918 - The New York Tribune ran from April to June a six-part attack on Hearst's loyalty, published in a pamphlet "Coiled in the Flag -- Hears-s-s-s-t." The Tribune reported July 22 that a dead Prussian soldier at Hill 304 in Verdun had a copy of a German newspaper with a Hearst editorial, and on July 31 that hanged German spy Bolo Pacha had a letter that named Hearst as his friend. 1919 - Phoebe died; The Chief inherited $7.5 m plus debts of $10 m; built Cosmopolitan Studio to make Davies a movie star; hired Joseph Urban as art director and gave him champagne on his new yacht, the Oneida. he began working with architect Julia Morgan to build San Simeon on the 60,000-acre ranch along the Pacific and the Santa Lucia mountains. Morgan rebuilt the pier in the old whaling village so steamers could unload raw materials. He leased a 5-story warehouse on 143rd St. in the Bronx to store his art collections. 1920 - He opposed League of Nations and Al Smith. He failed to get VP nomination; His Cosmopolitan films were distributed by Adolph Zukor and Paramount. 1922 - He lost NY governor nomination to Al Smith. 1923 - He was slow to establish tabloidMirror in New York. 1925 - Cosmopolitan Productions merged with MGM in March; Alice Head purchased St. Donat's castle in Wales; Millicent agreed to live separate life with her charities such as the Milk Fund. 1926 - Marion moved into Ocean House on the Santa Monica beach. 1927 - Hearst bought the 140-room Belmont house on the Long Island beach for Millicent, the model for the Great Gatsby's mansion in F. Scott Fitzgerald's 1925 novel; Hearst sponsored the trans-Atlantic flight stunt, but the Old Glory plane crashed in the Atlantic with no survivors. He published the Avila documents in November that described plot against U.S. by communist Calles and bribery of 4 Senators. 1928 - Hearst Radio Service network began on the West Coast; trip to Europe with Marion and decorated St. Donat's castle in Wales, published secret Anglo-French military expansion treaty; refused to use religion issue against Al Smith; supported Herbert Hoover for president. 1929 - He started a press campaign against World Court after Hoover proposed U.S. membership and allowed Congresswoman Ruth McCormick, sister-in-law of Cissy Patterson, to speak against it over the radio; Winston Churchill visit to San Simeon in September; signed talking picture alliance with William Fox and his Movietone Newsreel and started Hearst Metrotone Newsreel in October; converted Embassy Theater in NYC to all-newsreels Oct. 28; Marion indicted for income tax fraud. 1930 - After expulsion from France, Hearst made a very public arrival in New York, greeted by the Disabled American War Veterans, led national lecture tour for isolationism. However, his isolationism was selective; he approved intervention in Mexico and the Pacific but not in Europe; he opposed disarmament treaties, the Dawes Plan, the Kellogg-Briand pact, the World Court. He signed Adolph Hitler to write articles for his newspapers, the first was published Sept. 28 and the second Oct. 5. He sold public shares of Hearst Consolidated Publications, Inc. and raised $50 million. 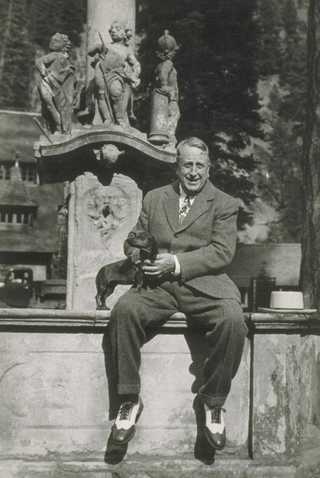 1931 - He rebuilt Wyntoon in northern California after fire; operated the two largest bread lines in New York for the unemployed that inspired Yip Harburg to write the song "Brother, Can You Spare a Dime" for the show Americana; proposed $5 billion public works plan in June 5 radio address over CBS, and began relentless attacks on President Hoover. 1932 - San Simeon became social center for Hollywood. Hearst wanted John Nance Garner for president but helped Joe Kennedy nominate FDR; contract with Mussolini and Margherita Sarfatti for 26 articles. 1933 - He produced Walter Wanger's Gabriel Over the White House film for MGM; supported NIRA Aug. 16 by displaying the Blue Eagle, but turned against the NRA Oct. 29. 1934 - Marion ended deal with MGM and signed with Warner Bros; Hearst changed from pro-union to anti-union by opposing the American Newspaper Guild; helped break the San Francisco general strike; met with Hitler during European trip; began an anti-communist witch-hunt. 1935 - Hearst's "last crusade" was his opposition to FDR after Jan. effort by Roosevelt to join the World Court; he opposed the second New Deal as Roosevelt's "Raw Deal" especially its plan to tax the rich as announced in FDR's June speech to Congress. Gov. Frank Merriam passed a steep income tax in California. Hearst tried to control Landon in the 1936 campaign, but was unsuccessful. 1938 - Hearst's assets were cataloged and began to be sold by trustee Judge Clarence Shearn; was anti-British and pro-peace as Hitler took Austria and Czechoslovakia. quotes are from David Nasaw. 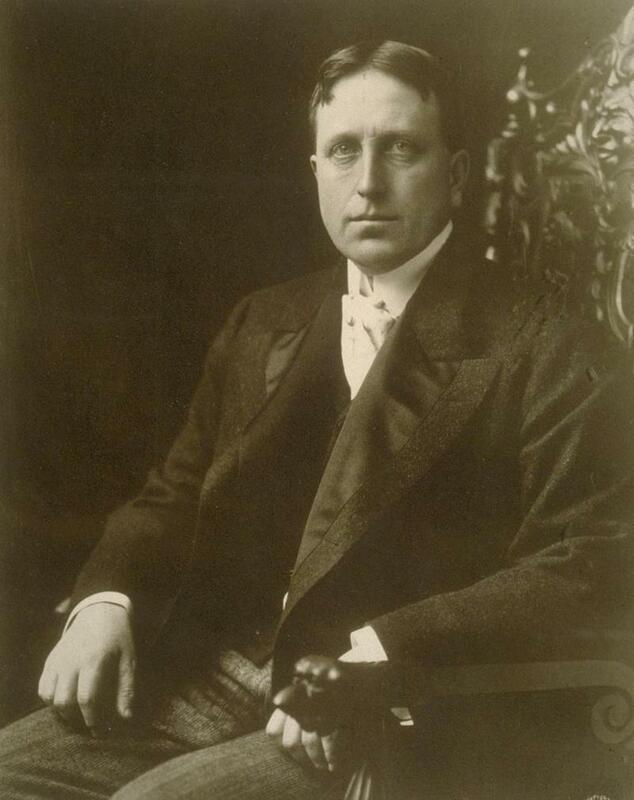 The Chief: The Life of William Randolph Hearst. New York: Houghton Mifflin, 2000.